A flagstone path winds around a water-filled basin en route to the terrace. Landscaping on a slope presents challenges, as Millie Livingston discovered. Her garden is situated downhill from her house, but she wanted an outdoor dining area at house level. 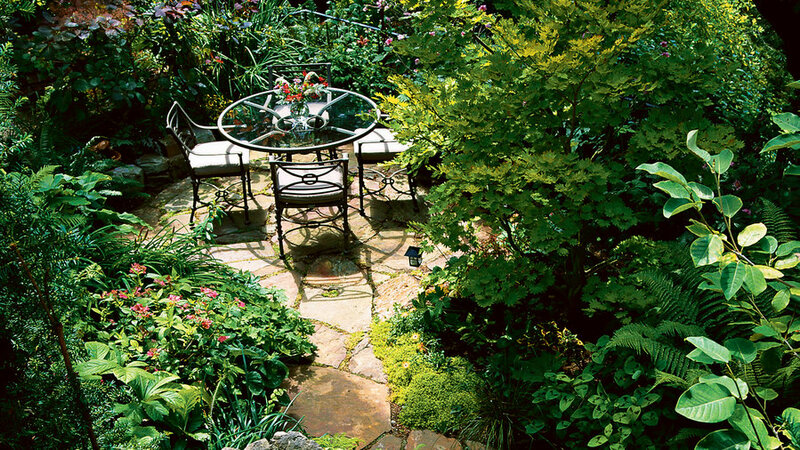 Designer Jay Ferguson fulfilled her wish by widening a portion of a path and turning it into a circular terrace. Paved with flagstone, the approximately 9-foot-wide terrace is fringed by plants that can tolerate the site’s alternating periods of shade and full sun. Ferguson chose a large golden fullmoon maple (Acer japonicum), two deciduous magnolias, and native ferns (Adiantum aleuticum, Blechnum spicant, and Polystichum munitum), plus a few exotics like hellebores, rhododendrons, Siberian irises, smoke tree, and yew. Together, the plants give the garden a lush look that comes mainly from foliage in shades of apple green, lime green, and bronze (with a subtle spritz of flower color), while providing a sense of enclosure and privacy. Next to the curving path that leads to the terrace, Ferguson built a gravel-lined reservoir and put a stone basin over it. A recirculating pump sends a constant stream of water down a split cedar flume into the basin. Bathed in the sound of softly falling water, the terrace is a magical space, especially at night, when Livingston lights it with candles.